Seeing into the mind of an adolescent takes more than memories of your childhood. You also need to be willing to look beyond your own childhood experiences and learn from others who have studied children like yours. You may never know exactly what your child thinks that causes them to behave as they do. 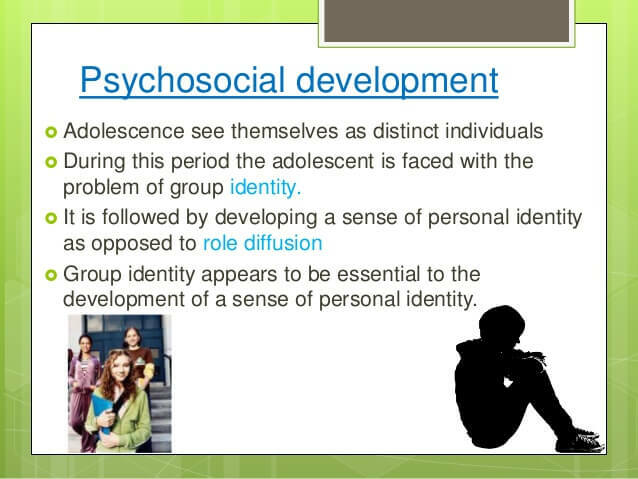 However, with some basic knowledge of cognitive development in adolescence, you can understand and help them more. A child's brain develops dramatically during the adolescent years. Some brain regions get bigger, while others get smaller. The prefrontal cortex matures more rapidly during adolescence, too. These brain changes also come with changes in cognition, which is another word for thinking. Cognitive development refers to the changing thought processes that occur as we mature. Cognitive development begins as soon as we're born (if not before) and continues into adulthood. Cognitive development in adolescence brings about important changes that allow us to transition from a child to a full-fledged, mature adult. Jean Piaget's work on cognitive development was an important breakthrough in psychology. 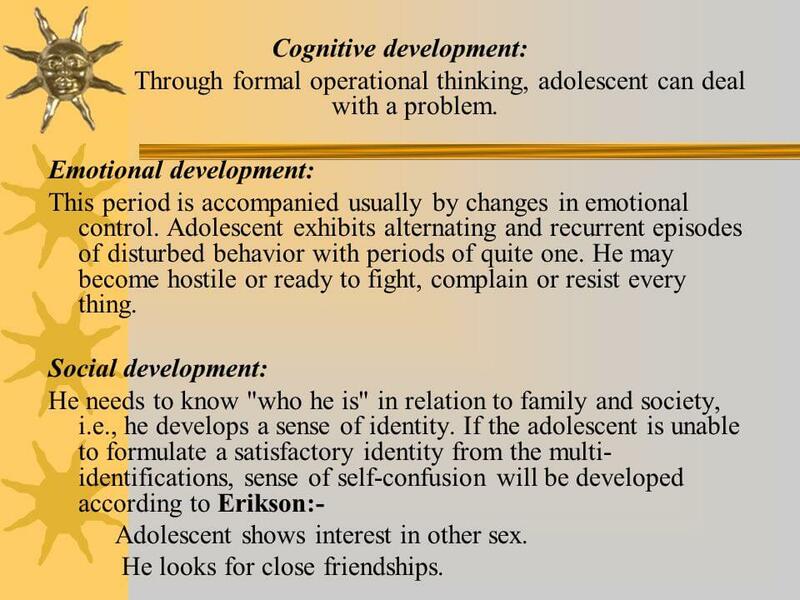 Piaget used the term "Stage of Formal Operations" to describe the stage of adolescent cognitive development. This stage is the one in which children gain the ability to think in abstractions and hypotheticals. They begin to use their imaginations in more practical ways. While young children may use their imaginations in play, adolescents use their imaginations to understand people and subjects more completely. A 5-year-old might learn to subtract by manipulating concrete objects. They may take two pencils on one side of their desk, and six pencils on the other side of their desk put them all in one pile, and count them up to find out there are eight pencils in total. An adolescent doesn't need to think of pencils or any visual representation at all to be able to know that 2 + 6 = 8. In fact, they can solve much more complex math problems without any reference to physical objects of any kind. Adolescents also develop the ability to imagine hypothetical situations. The hypothetical situation might be a social situation, a subject they're learning about, or a challenge they're considering taking on. They can imagine how it will go and make decisions about whether or how to approach the situation based on their abstract and hypothetical reasoning. Their ability to reason deductively increases. They develop better decision-making skills. Their working memory capacity and ability to retrieve memories increases. They get better at choosing what to learn. Their ability to learn autonomously increases. Increases in declarative knowledge. When you say, "I know that…," what you're talking about is declarative knowledge. This type of knowledge includes facts, concepts, and formulae. Increases in procedural knowledge. When you say, "I know how to…,' you're talking about procedural knowledge. Adolescents can acquire new skills and techniques more easily than they might have when they were younger, although this is not always the case. For example, language learning is easier for a preschooler than a high school student. Increases in conceptual knowledge. Conceptual knowledge, the "I know why" type of knowledge, typically increases at a dramatic clip during adolescence. With their newfound ability to think abstractly, the why's of life become not only more understandable but more fascinating as well. As children go through adolescence, they gain the ability to see one problem from many different perspectives. They can see diverse parts of the problem that may or may not be relevant to the decision at hand. Until they get used to seeing the complexity of life's problems, they can appear unfocused. As they gain experience with seeing things this way, though, they become better problem-solvers. Adolescents spend a lot of time thinking about themselves. This may seem selfish of them if you're looking on like a mature adult. However, it's important that they have opportunities to consider what they think about themselves and their world without harsh judgment from parents or teachers. Certainly, there is a time and a place for self-reflection. At that moment, though, they can develop a stronger sense of who they are and what they want from life. Cognitive development in adolescence has another task, too: it prepares them for their future careers and relationships. During adolescence, children begin thinking about what they want to do when they go out on their own. They compare themselves to ideals. They explore different careers. They begin to make different life choices than they see their parents making. Their most important goals are set for the end of their adolescence and the beginning of their adult life. Another aspect of adolescent cognitive development that's related to abstract thought is trying to understand the psychological characteristics of their peers and others. They make guesses about how others think. Then, they use the resulting assumptions to guide them in deciding how to interact with that person or whether to interact with them at all. Adolescents usually base their friendships on similarities between their psychological characteristics and those of others. For example, an adolescent who sees another child as being extroverted may choose another extrovert as a friend. An adolescent who sees themselves as honest may also choose friends who appear to be open and authentic. So, why does it even matter what or how adolescents think? After all, it isn't as if we could impose our own cognitive rules on them. They have to move through adolescence in their way if they are to become mentally healthy adults. Still, there are reasons you need to know if you're a parent of an adolescent child. No one wants others to discount their abilities, and this is especially frustrating for adolescents. To have a healthy relationship with your child, it is important to acknowledge their level of cognitive development. Give them credit for understanding concepts and abstractions better than they did as a young child. Anything else insults their intelligence and can drive a wedge between you. 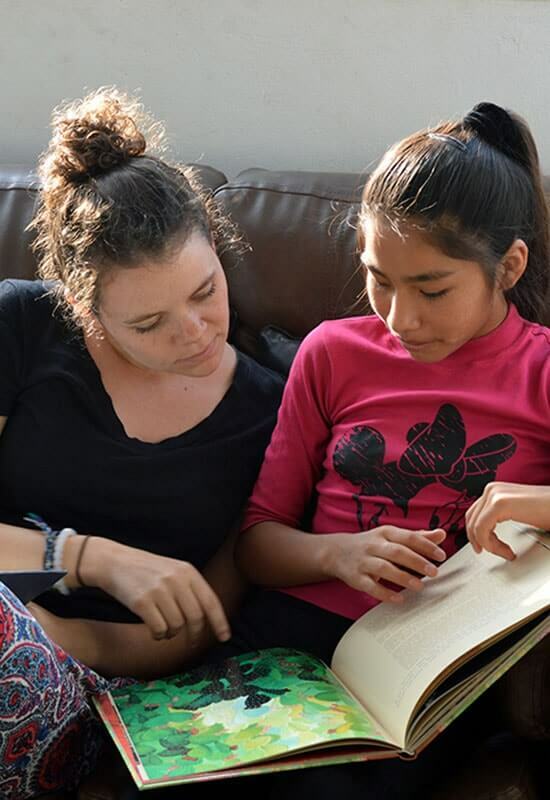 During adolescence, children are at a stage where they are conflicted between wanting to be on their own and wanting to be taken care of by someone more capable. If you don't understand their level of cognitive development, it's unlikely that you can provide them with positive emotional support through these difficult years. Instead, you'll find that you miss the mark as you try to help without truly understanding. Adolescents are busy gaining autonomy, so when difficult problems come up, they may feel inclined to try to manage them on their own. Certain problems may require cognitive skills they're just now developing. If you know how far along they are in cognitive development, you have more ability to meet them where they are to help them solve the difficulties of adolescent life. Of course, school is one of the most important parts of life for your adolescent. It takes up a lot of their time and prepares them for what lies ahead of them. Your child's teacher will almost certainly have an opinion on what level of cognitive development your adolescent is at any given time. They might share that information with you, especially if your child is having learning problems. However, it's important not to just take the educator's view as absolute truth without assessing the situation from your parental viewpoint. You have access to information about your child that their teacher might not have. You know your child in a way their teacher doesn't. As you take an interest in your child's cognitive development, you can discover where they need additional help and be proactive in getting it for them. You can also see where they might be coming up shy of their potential. If so, you can encourage them to try new things or work harder on what they're already doing. You can also provide them with appropriate learning opportunities for their stage of development. As a parent, you can learn a lot about your child's cognitive development. Still, there may be times when you just can't understand why your child thinks the way they do. Often, this happens simply because adolescence is a time when change can happen rapidly. It can also happen differently for different adolescents. Even an expert might not have all the answers, but they can certainly help you figure out ways to make your child's adolescence go more smoothly. You might need to talk to a therapist to understand more about your child and your relationship with them as they go through this final phase of childhood. If so, you can talk to a licensed counselor at BetterHelp.com for convenient, affordable online therapy. Adolescence can be a bumpy road to follow, but once your child makes it through to their destination, they can become a healthy, mature adult.